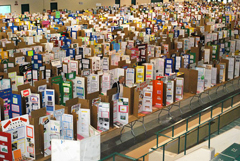 The Academy of Science - St. Louis Science Fair is an initiative of the Academy of Science of St. Louis. Click here to learn more about the Academy. their own learning in the process. soar! What more can you ask for?" Do you have a MAKER Space in your school? You can now submit your "MAKER" projects at the Academy of Science - St. Louis Science Fair! Showcase the engineering, invention and models that your students have been working on. All MAKER projects are eligible for ribbons and Awards! Students in Grades 9-12 self-select in with teacher recommendation. Students who have completed collegiate level projects are eligible for the Honors Division which is held during the first Saturday in February. Click here for Honors Division key facts, registration forms.